OSWEGO, NY – Tuesday, May 31, is World No Tobacco Day. This year, the World Health Organization (WHO) and the Tobacco Free Network of Oswego County are teaming up to send a clear message to cigarette makers: We’ve Seen Enough! According to the WHO, young women are a major target for the tobacco industry in its effort to recruit new users to replace those who will quit or die prematurely from tobacco-related diseases. 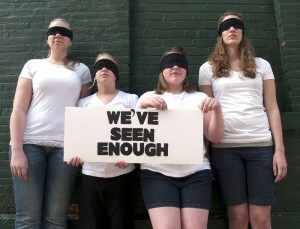 Young women around Oswego County are saying "We've seen enough!" to tobacco marketing targeting them. Tobacco use is the leading preventable cause of death and kills more than five million people every year, about 1.5 million of whom are women. Many local women are using World No Tobacco Day as an opportunity to stand up to these giant, cancer-causing, corporations – letting them know they won’t allow tobacco companies to push them into a lifelong tobacco addiction. Tobacco companies spend billions of dollars each year marketing their deadly products at the point of sale. This is done by controlling dominant display space in retail stores and through in-store advertising. Both are typically found around the cash register, sometimes referred to within the industry as the “goal post” because it is the one place in the store where everyone must go. Tobacco companies invest a lot at these locations in creating power walls of large, visually appealing displays of products intended to attract the interest of customers. The Tobacco Free Network of Oswego County along with the Oswego County Health Department and the Rural Health Network of Oswego County will be holding events throughout the summer months to promote healthy living for the women of Oswego County. Events include a Mother’s Day pampering event at the Fulton YMCA on June 4 from 1 – 4 p.m., a fun and fitness event at the Oswego Relay For Life, held at the Oswego High School track on June 10 at 7:30 p.m., and the fun continues on July 23 at the Oswego Public Library with a scrapbooking event from 1 – 4 p.m.
Each event is free to the public and will include great information and giveaways.